Toradex is launching early access for the Colibri iMX8X System on Module. It features the new NXP® i.MX 8X SoCs, making it the only SoC from the NXP i.MX 8 line to be equipped with Arm® Cortex®-A35 cores. In this article, we'd like to give you a little insight into this new processor and how it compares to others. The Arm Cortex-A35 is the most efficient Armv8-A 64-bit processor. It is fully compatible with Armv7-A 32-bit cores, such as the Cortex-A5, A7, A9 and A15, featured on many Toradex SoMs with NXP and NVIDIA® SoCs. It uses an eight-stage, in-order pipeline which is optimized to provide the full Armv8 feature set while maximizing power efficiency. Boasting improved power management capabilities, the Arm Cortex-A35 offers not only heightened efficiency, but also reduces idle power consumption, extending battery life and minimizing heat generation. For the Colibri iMX8X, Toradex equipped the module with low-power LPDDR4 RAM to further lower the SoM's power consumption. Toradex provides Linux base software with integrated power management to ensure that you can benefit from these low-power features, either fully automatically or using quick and easy manual configuration. The Cortex-A35 runs both 32-bit and 64-bit code, allowing you to take advantage of the new features while providing full backwards compatibility. Unlike the Cortex-A7, the Cortex-A35 offers you all the new features of Armv8, such as 64-bit support and thirty-one 64-bit general-purpose registers instead of fifteen 32-bit registers. There are also several improvements to the NEON unit, resulting in large performance improvements for tasks such as machine learning and computer vision. The Cortex-A35 can deliver up to 40% faster performance than the Cortex-A7 — at the same clock speed — while consuming 10% less power. Cortex-A7 cores can be found on Toradex's Colibri iMX7 and Colibri iMX6ULL System on Modules. The Cortex-A35 and Cortex-A53 share a lot of similarities, including the 64-bit Armv8-A architecture, an in-order, limited dual-issue architecture with an eight-stage pipeline. 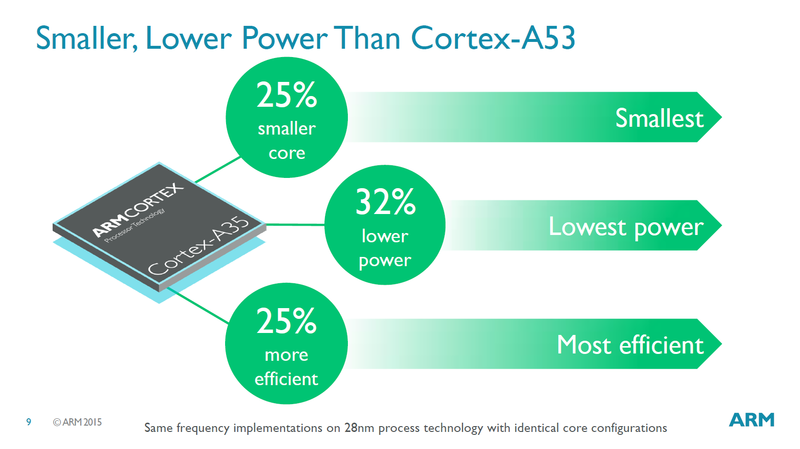 At the same clock speed the Cortex-A35 reaches 80%-100% of the performance of a Cortex-A53 depending on the workload; interestingly, it only consumes 68% of the available power when doing so. You can find the Cortex-A53 inside the Toradex Apalis iMX8, together with high-performance Cortex-A72 cores. To find out how the Cortex-A35 performs in your application, sign up to receive access to the Colibri iMX8X. On this Colibri SoM, we provide two or four Cortex-A35s, clocked at up to 1.2GHz and paired with 2 GB LPDDR RAM and up to 8 GB eMMC. You'll also have a Cortex-M4 microcontroller core to further lower power consumption or offload real-time tasks.